After 13 years of good luck, we’ve redone our website. See images of new, above, versus old, below. Along with our new website, we’ve fashioned a new logo. We are pleased to announce that we’ve added a word to our business name, 12South Kaspermusic Conservatory, to better reflect our location. We’ve also retired the old spelling with a capital M in the middle, KasperMusic, in favor of the more streamlined Kaspermusic. 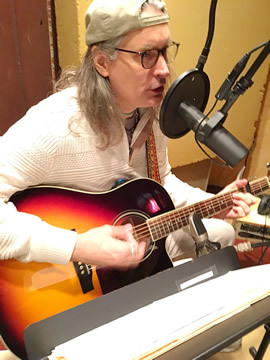 Jonathan Kasper knocks out 21 new original songs for his next two rock albums. He held band rehearsals in his home guitar studio to be ready to record. 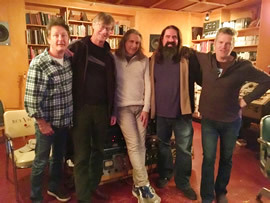 Pictured above are Doug Kahan, bass; Jerry Kimbrough, guitars; Jonathan, vocals & guitar; Wes Little, drums & percussion; and Brad Jones, producer at Alex the Great Recording Studios in Nashville, TN. Stand by for purchase and release info later this year. We're so proud of Caitrin Anderson, now majoring in Vocal Performance at Lee University in Cleveland, TN. 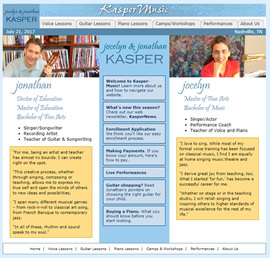 Caitrin became a Kaspermusic voice student just a year before required college auditions. She worked hard toward her dream, taking two lessons a week straight through two summers, and also studied guitar and songwriting. She made it! 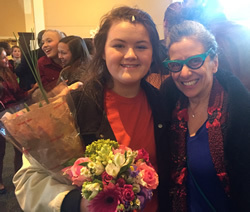 Fiona starred in a pants-role (see letter jacket), playing Scott in Harpeth Hall's production of Dear Edwina Junior. Rebecca M. and Charlotte both appeared in Franklin Road Academy's production of Working, The Musical. They also performed solos in the FRA annual Cocoa & Carols. Rebecca A. had a supporting role in University School of Nashville's production of Urinetown, The Musical. Sorry no photos! Ms. Kasper preps for a full house on one of several recital days. 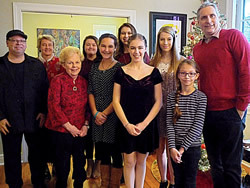 Kaspermusic voice students performed one of two annual recitals. Pictured from left are Dann Childers, piano, and singers Diana, Helen, Fiona, Stephanie, Charlotte, Becca A., Becca M., Kiki, and Jonathan. 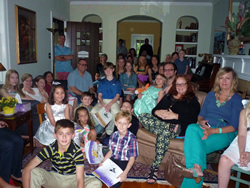 Kaspermusic guitar and piano students and their families ready for their spring recital as a major storm knocks out electricity. Thank goodness for cellphone flashlights! 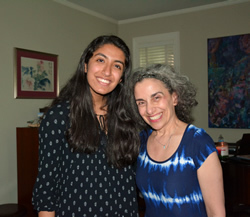 Ms. Kasper with longtime Kaspermusic student Neha after her successful piano recital performance. 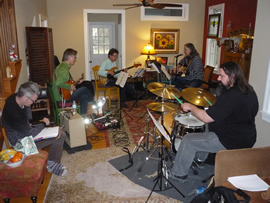 12South Kaspermusic Conservatory has partnered with the Nashville Chamber Music Seies to host house concerts. The Kobayashi/Gray Duo, violinist, Laura Kobayashi, and pianist, Susan Keith Gray, performed music by female composers. 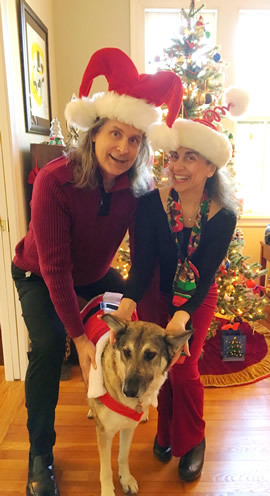 They are pictured here with NCMS coordinators, Patrick Dunnevant and Michael Quintana, hosts Jocelyn and Jonathan Kasper, and foster dog Lexie. 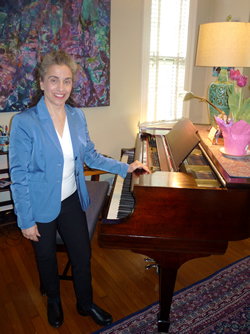 Kathryn Satoh and Elizabeth Newkirk comprise Bow & Hammer, a violin/piano duo from Chicago, IL. 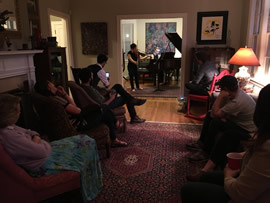 Our audience enjoyed a subdued salon environment, again with dog guests, to soak in the unusual music. Alexis "Lexie" Bernadette Kasper has moved in as a permanent member of the family and co-hostess of our sing-along potluck holiday parties. 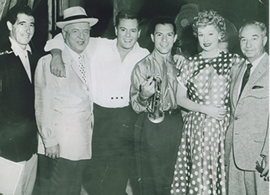 Many relatives and colleagues gathered in L.A. in April to celebrate the life of trumpeter Tony Terran, Ms. Kasper's cousin and last surviving member of the Desi Arnaz Orchestra. Read more about Tony here and here. 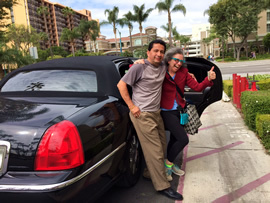 Jocelyn arrives in the city of angels. After a night of no sleep, she romped all over Disneyland for 12 more hours before finally collapsing in her family suite (background). 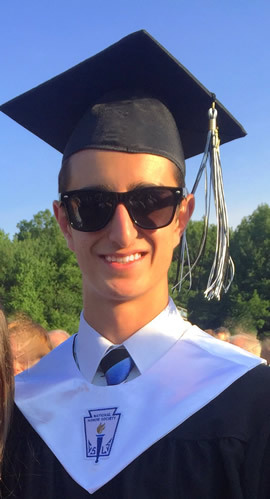 Reed graduates in shades and with honors from Rye Neck High School. 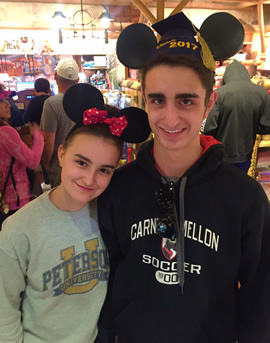 He's headed to Carnegie Mellon University where he's already guaranteed a spot on the soccer team. He won second place in the New Westchester Symphony Orchestra Concerto Competition. 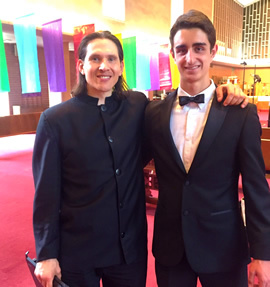 Pictured here with conductor Benjamin Niemczyk. Here's Lily's professional headshot for her acting work. 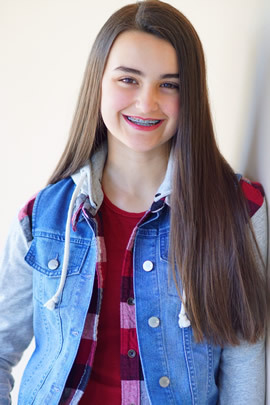 She's got a long résumé which includes several feature films: this year's The Book of Henry with Naomi Watts and Maddie Ziegler; the Will Smith 2016 Collateral Beauty; and the Jamie Foxx 2014 remake of Annie. Here's Reed performing Beethoven's Concerto No. 3 in the winners' concert with the New Westchester Symphony Orchestra. Prepare to be amazed while Reed practices Liszt Paganini Etude No. 6 for his TEDx performance (also on YouTube). Here's an edited and annotated video of Reed's HS varsity soccer highlights. He plays CM/F position (Central Midfield/Forward), jersey #7. Make sure you catch the interview at the end. Watch Lily's ever growing acting reel here. Lily's voice is on Sprout TV as the blond yodeling girl Lena in the Alps. Warning: includes cute animated dogs yodeling! Here's Lily in live performance as the Mother Abbess singing "Climb Every Mountain" with full orchestra accompaniment. Lily in recital at Hoff-Barthelson Music School, playing Handel's Air.